You might have seen before the brown or green kaya, you might have tasted it before, but have you tried making it yourself? Well some of you might have but the result is not what you expected it to be, rather it appear to be lumpy and unappealing. Below might be the answer you are looking for to produce the smooth looking kaya. If you want your kaya to look commercial then ample amounts of sugar is needed to produce a gloosy smooth look. Home-made kaya requires patience as it takes time to cook it slowly and also to be able to control the thickness of the eggs to achieve smoothness. 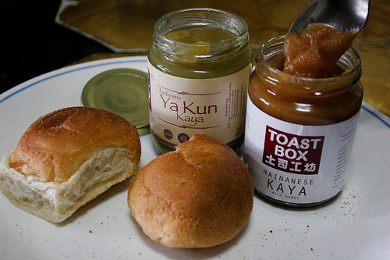 The two commonly known kayas are the Nonya Kaya and the Hainanese Kaya. Both kayas have different methods of cooking and the end result may vary. A quicker way can also be found here.